You’d think that it shouldn’t be possible to get lost under water. That might be true if you stay really close to your boat but otherwise you end up lost pretty fast. Why you ask? Well, you’re going on the dive and you find all those amazing looking fish, coral and other fun sights. And before you know it you have no clue anymore how far you’ve gone or which direction. You might have swam in circles without realizing it. If it hasn’t happened to you then you can rest assured that there’s a good chance that eventually it will happen. The good thing is though that there are proven methods to find your ways around to navigate from a boat or shore. Even in unfamiliar environments and with poor visibility there’s ways to find your way. Unfortunately or fortunately, there are neither roads nor street signs under water. The good thing about it is that we’re not screwing around with nature and preserve the beauty of the sights to be seen. The bad thing is that after a while things start to look the same. When that happens and you don’t know anymore where you are, you have to rely on yourself and your buddy to find back to where you started. You start with yourself. Be realistic about your skills with regards to navigation. And no, that’s not the skill of finding your way around a city or town. The skills required underwater are slightly different. Yet, you can train them and improve them as well as learn to master all the gear that exists and that you have to help you find your way. Assess your strengths and your gaps in knowledge and then work on overcoming those. It is essential to be comfortable with your gear that can help you navigate the waters. Most of us will not dive in uncharted waters. Chances are that you’ll dive in an area where many others have dived before. And that usually means that you can find charts, information about previous dives and even pictures online. You can print charts and other relevant information on waterproof paper to have available when you’re diving. Or even better, you might have dived there before. In that case check your dive logs (written or in your scuba computer) to plan your dive based on your own historic data. Click here to find the lowest price of the Atomic Aquatics Cobalt Dive Computer Console with built-in compass on Amazon! Getting as much information about a dive site upfront will help you stay confident and oriented under water. You might see landmarks that you recognize from your research or past dives that will help you navigate the waters. If you have printed images of sights or have written down information on a slate to recognize certain sights then you’ll have a much easier time to find your way around. If you start your dive from shore then make a mental note of any landmarks that can help you when you surface to find your way back. A lighthouse for example can be a great navigation point to find your way back. Your compass is your main navigation instrument under water. Not knowing the fundamentals of using it is a definite recipe for getting lost under water. Unfortunately, many divers neglect the use and the training required to be able to effectively use a compass. Often, we are going down in groups and we’re simply following the dive guide or instructor without worrying too much about what direction we’re even going. Purposely start to use your compass and make notes on a slate under water about changes in direction you take and what time into your dive you took those directional changes. That way you can backtrack from where you came from. Start doing that whether you dive with a buddy or in a guided group. It’s even better if you have a dive computer with a built-in compass. It will record navigational changes for you and you can later evaluate your dive log to see where you changed directions. You will have to make a choice what kind of compass and what kind of mount you want and feel most comfortable with. 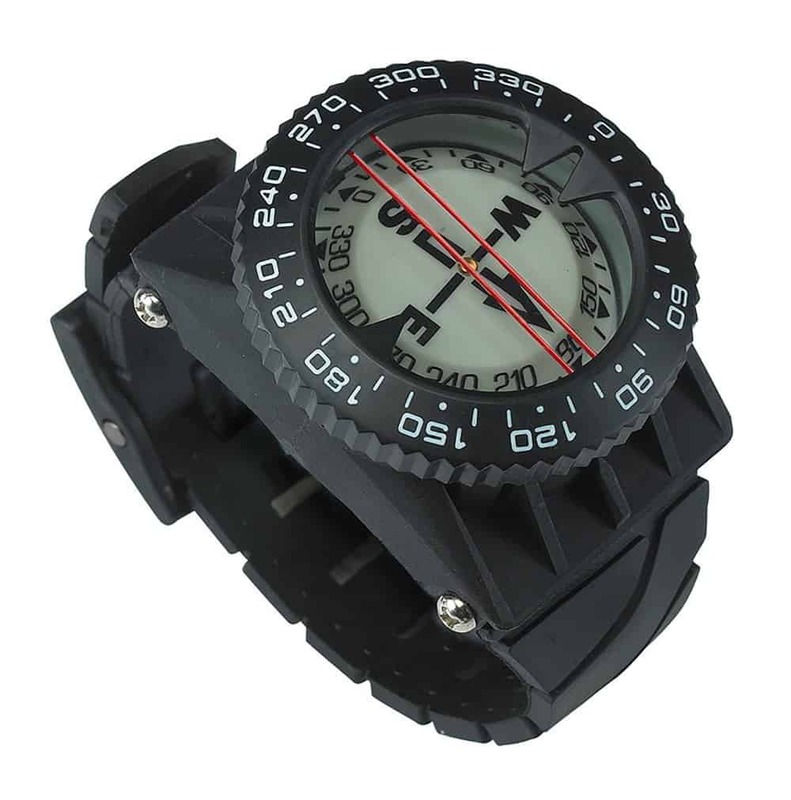 Many, if not most divers use a compass that is part of their console. 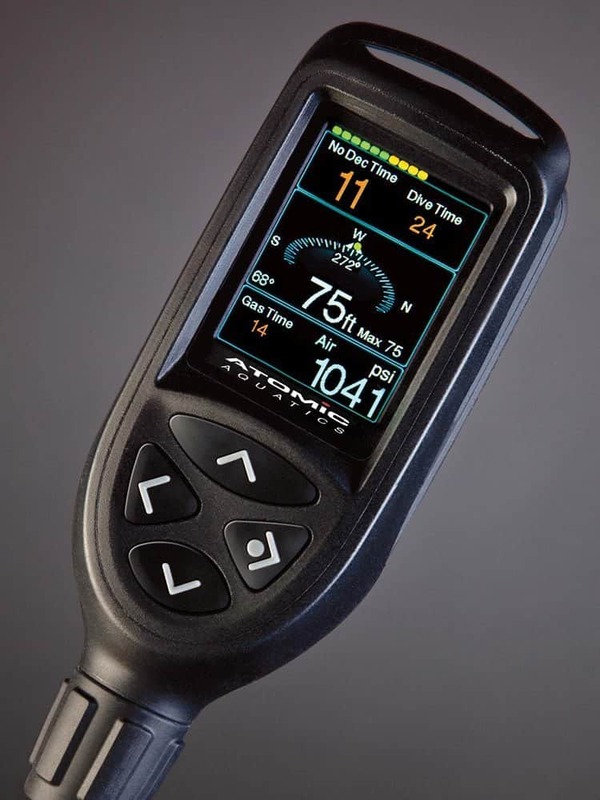 A growing number rely on the compass as part of their scuba diving computer while others use a compass that is mounted to their wrist. No matter what you prefer, start to consciously use it. Becoming best friends with your compass will help you raise your awareness of when you change directions and why. Your compass is your trusted piece of equipment to tell you where you’re going. 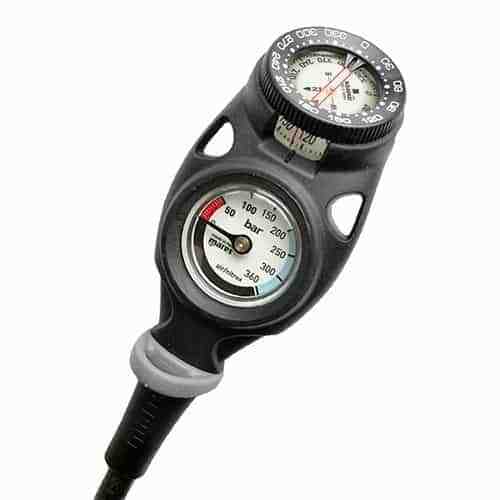 Click here to find the lowest price of the Mares Mission 2C Gauge with pressure gauge and compass on Amazon! A compass does not only work under water. It works the same above water and the principles stay the same. Start to do some exercises on land where you navigate by using a compass. Take notes of directions and times and then start to track back the way you came with the help of the compass and your notes. Practicing this kind of navigation will improve your skills. It will also raise your confidence and eliminate any self-doubts. Under water you will remember those exercises and they eventually become second nature. Clues are all around you. Certain formations of coral or other landmarks under water can be of tremendous help to navigate. Try to find landmarks that are within sight of each other so you can navigate from one to the other. This kind of situational awareness allows you to enjoy the sights as well as help you find your way under water. Again, diving in groups with a guide allows us to often forget to remember the landmarks underwater as we’re just concentrating on seeing the sealife around us. Start to purposely look out for landmarks that are worth remembering and then mark then down on your slate. Train your situational awareness and eventually it’ll be second nature. Also, and this is a big and easy one, pay attention during briefings. You’ll be surprised how much information you’ll gather from them and how much you actually can navigate simply based on remembering them. You’re diving with a buddy. It will always be of help if both (or all) of you keep track of your position as well as the direction you’re heading. It should not just be the responsibility of one diver to take the navigation responsibility but it should always be a team effort. It’ll also help to compare navigational notes and techniques afterwards. There’s always something to learn from what others do and how they do it. Start to make navigation a topic of your pre-dive discussions/briefing with your buddy and purposely split the task. Use the different gear that is available to help you with finding your way under water. Train yourself to look out for marks and sights and make it a habit to make notes about them. The better your log the better your navigation will be. And most important you have to practice and practice more. Your skills only improve when you use them and practice them.